If you still don't know which side to take on the format wars but want to test the waters without spending too much then you might want to try the Toshiba HD-A2 when you want to see how HD-DVD feels like. The Toshiba HD-A2 is a step up from the previous Toshiba HD-A1 player and though there are other newer HD-DVD players that are out in the market, the Toshiba HD-A2 is the cheapest and with rumors that Best Buy and Walmart will be selling the Toshiba HD-A2 for under $100, then this is probably the player that you should get when you just want to see for yourself what HD-DVD is all about. The Toshiba HD-A2 has very standard features. You get 720p and 1080i HD output, 480p, 720p, and 1080i SD Upconversion, backwards compatible with DVD Video, DVD VR, DVD-R, DVD-R DL, DVD-RW (video only), CD, and CD-R/RW. The Toshiba HD-A2 supports 5.1 channel Dolby Digital, Dolby Digital Plus, Dolby True HD, DTS, and DTS HD core. Terminals on the Toshiba HD-A2 are: Video Composite, S-Video, and component outputs, 2 channel analog audio output and digital optical output, HDMI output, Ethernet 10/100 base port, and 2 extension terminals. 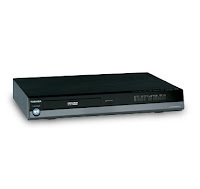 If you're wondering what's an Ethernet port doing on an HD-DVD player, it's for downloading additional content provided by studios such as trailers, soundtracks, and other media and also for updating the firmware of your Toshiba HD-A2. Speaking of firmware updates, as you can see from the specifications, there's no DVI input, however you can use a HDMI output with DVI connector. The Toshiba HD-A2 previously had a problem playing 1080i pictures using the HDMI-DVI connector but the firmware update fixed the problem.